The Postal Address: 71 Betty Lane, East Waterboro ME 04030. Custom 3 bedroom lakefront year round home. 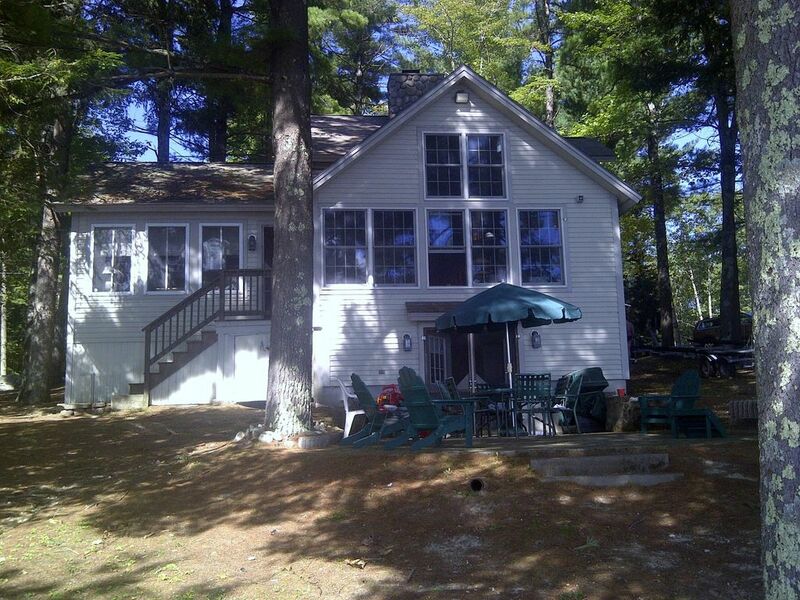 Perfect for your Maine vacation retreat, settled among large pines. Sleeps 6-8 comfortably. Light and bright great room overlooking Little Ossipee Lake! Cozy stone fireplace, hardwood floors, modern kitchen & full bath. First floor master bedroom/master bath. 2 bedrooms upstairs and some bunk beds in the basement. Beautiful views. 90 ft. sandy waterfront & dock. No smokers/No pets please. Little Ossipee Lake is approximately 3.5 miles long. The water quality is FANTASTIC and is great for year round recreation. A public boat launch is accessible 24-hours a day, 7-days a week. So bring all of your equipment, including personal watercraft, and enjoy a southern Maine vacation during the warmer months. But don’t forget about winter time because the lake can freeze over, giving you access to winter fun. And its close proximity to mountain ski resorts is an added bonus. Our family has been coming to Little Ossipee Lake since 1974. It is a wonderful place to enjoy a vacation no matter the season. Little Ossipee Lake is in the town of East Waterboro, ME. Your basic grocery needs and other essentials are only a few minutes away, so you don’t have to remember to bring everything with you. Bath Towels are provided, but not Beach Towels. Please bring your own beach towels. 100% refund for cancellations more than 60 days before check-in date. The house was awesome. Had everything you could need. Gorgeous lake and dock. The owner was very nice and responsive. It felt like “our” home for the week. We had an amazing time. This is our 3rd year and hoping to go back next year. My family had a fabulous time windsurfing, kayaking and enjoying the beauty of this lake. The house was perfect for my family of four and my parents. Anne the owner is very helpful and responsive. You won't be disappointed by this vacation home right on a crystal clear lake...and very nice neighbors too! Excellent place! Would definitely return! My wife, two young children, mom, and dad just retuned from Maine! We had a wonderful time at this home! It was beautiful and plenty big for our family! It was right on the lake, the kayaks were great, and the water was fun for my 2 year old, the kitchen was very well equipped! Nice place for a quiet vacation, well... as quiet as it can be with two little children! Check in and check out day is SATURDAY. Check out by 10 am..Check in at 3 pm.